Periplaneta fuliginosa (Smoky Brown Cockroach). Size: approx. 30-40 mm. Photo: 08/04/11, 11 am. This rather large insect is a Smoky Brown Cockroach (Periplaneta fuliginosa). 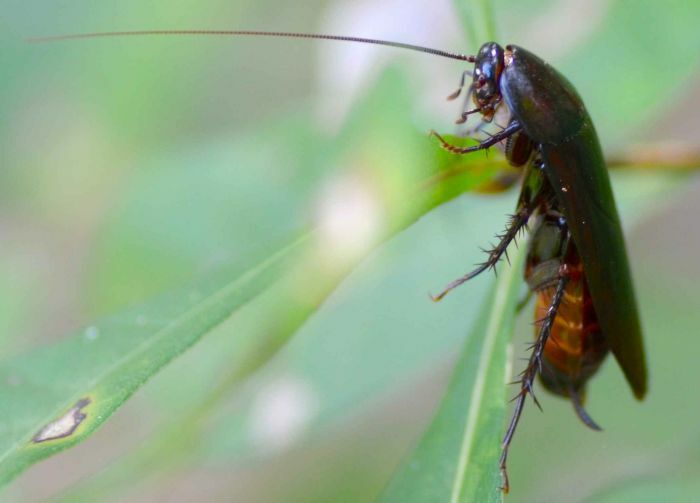 The roach has very long antennae and a rather uniform (very dark and shiny) color. The Smoky Brown Cockroach requires moist conditions and is typically found in leave litter, pine straw, tree holes etc. They are able fliers and can become a pest in houses but are more likely to be found in attics, garages etc. Their forage radius is about 30 m. The larger American Cockroach is in the same genus.